Many of these editions are now difficult to obtain in paper form and the opportunity to read them directly on the computer screen makes EAS a significant anthological republication. Most of us, for example, have access to the First Folio and the quartos, either through the Norton Facsimile of the First Folio, Allen and Muir's Shakespeare's Plays in Quarto, the Malone Society publications, or through the many high quality facsimiles now online. Others of us may have Malone Society editions of such apocryphal plays as Sir John Oldcastle, The Taming of a Shrew, A Yorkshire Tragedy, or in collected editions The Book of Sir Thomas More. But how many of us can easily put our hands on such exotica as The London Prodigal, Thomas Lord Cromwell, The Puritan, Locrine, Mucedorus, The First Part of King John, The Second Part of King John, The Virgin Queen, Falstaff's Wedding, The False One, or The Womans Prize? The 95 adaptations included in EAS are perhaps even more difficult to locate in print form. The texts themselves are easy to read and in every case the full apparatus of the original edition has been preserved, including the often idiosyncratic cross-referencing systems typical of print technology's pre-maturity. However, for those of us interested in both the linguistic and the bibliographical codes, the electronic text's layout does not follow that of the underlying print edition. Lines of text are double spaced for ease of reading on screen, but there are no running titles, catchwords, signatures, or other bibliographic codes. Within prose passages the locations of the print editions' line-endings use marked with virgules ( / ). As useful as these reprints are in themselves, the primarily benefit of an electronic database is being able to interrogate an entire collection with a single query and collate the results in order to compare, for example, the decisions made by different editors facing the same textual crux. In EAS the enquiry can specify targets in any or all the following fields: 'Keyword' (any word appearing anywhere in the text), 'Edition' (categorized as in the list in paragraph 1 above), 'Genre' (any one of 'Apocrypha', 'Comedies', 'Histories', 'Late plays', or 'Tragedies'), title of 'Play/poem' (from 'Achilles his Concealment . . .' to The Winter's Tale', 'Author' (the editors and adapters from Anonymous to James Worsdale), and 'Speaker' (from Aaron in Titus Andronicus to the chorus of "Youths; [and] Virgins" in John Sheffield's adaptation of Julius Caesar). By implication, a logical AND is applied between all fields for which the user enters a target, so that specifying the edition "Johnson 1765" and the genre "Late plays" yields The Winter's Tale, Cymbeline, and The Tempest, but not Pericles since Johnson's edition excluded it. For entering targets into each field, one chooses potential targets from an alphabetized pick-list of target words/phrases which the database's indices show to be present within that field in the database. Browsing such a pick-list is convenient where the list is small (the 'Genre' field has just 5 possible targets) and the targets are highly specific (what some might call the 'Romances' must be specified as 'Late play'), but long pick-lists make the process awkward. Within the pick-list for 'Play/poem' one must scroll excessively to get from "Sonnet C" to "Sonnet XXXVIII", these being, contrary to most users' expectations, the first and last sonnets in a list alphabetized using a strict left-to-right rule. Longest of the pick-lists is that for the 'Keyword' field and again the strict alphabetization can keep related targets far apart. For example, "wall" and "vval", two typographic representations of a single word, are separated by hundreds of other words which begin "w-" or "v-". However, for 'Keywords' (but no other field) one may ignore the pick-list and freely type hoped-for target words and phrases. Moreover, within the 'Keyword' field two or more distinct targets may be combined using the Boolean operators AND (requiring that both targets be present in the play/poem), OR (allowing either target to be present in the play/poem), and AND NOT (requiring that the first target be present and the second target absent in the play/poem). By contrast, the relationship between multiple targets within any one of the other fields (within which the pick-list must be used) is limited to OR: the software supplies this operator automatically whenever a second or subsequent target is chosen from the pick-list and any attempt to replace this with one's own operator is punished by deletion of the targets already selected for that field. As well the standard Boolean operators, EAS offers three forms of proximity operator which allow one to specify that one of the target 'Keywords' must be "within x words BEFORE" the other, or "within x words AFTER" the other, or "within x words OF" (before or after) the other. Variant spellings can be specified using square brackets so that "lo[uv]e" will find "loue" or "love" and the wildcards '?' and '*' represent any single character and any string of characters, respectively. Having selected target terms in one or more of the fields, the user many opt to specific the scope of the search by selecting one of the following ranges: 'All material', 'Plays and poems with associated text', 'Plays and poems only', 'Songs and lyrics only', 'Stage directions only', or 'Castlists only'. In other words, one may elect to remove editorial apparatus or certain parts of the literary text from the purview of the search engine. 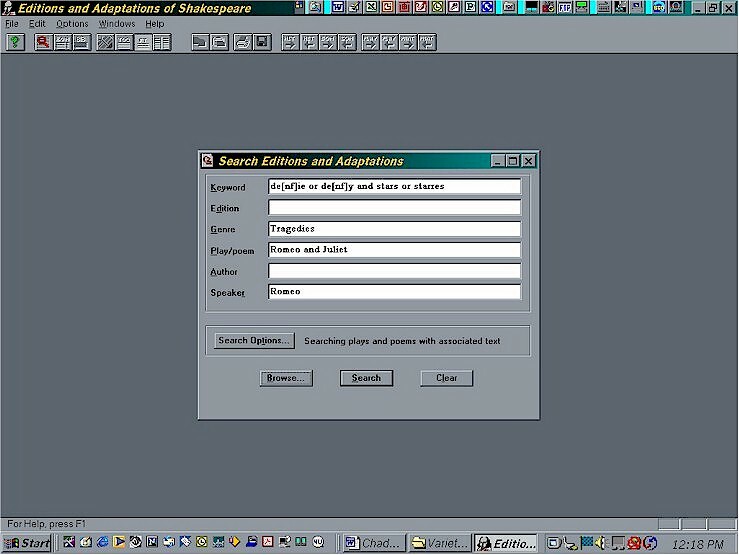 EAS has a number of slightly different variations on its 'Search screen' dialogue box into which target terms are entered, one for each of 'Search First Folio, 'Search Editions and Adaptations', 'Search Editions', 'Search Adaptations', and 'Command Line Search'. Only the last two of these make any real difference to the searching options and interface: 'Search Adaptations' adds an extra searchable field of 'Date published' which the others lack, and 'Command Line Search' offers no field names (these must be specified explicitly in the 'command line' string) and adds a window giving a history of past 'command line' searches. For most uses the 'Search Editions and Adaptations' dialogue box is best starting point, although by default (changeable via the menu choices "Options|Start-up Options") the software starts up showing the 'Search First Folio' dialogue. The casual user of the product might not even realize that this dialogue box gives access to only fraction of the riches within the database. One may also choose within "Options|Start-up Options" whether the database starts up showing the actual text of one of the editions, or its table of contents, or both, but the edition in question is always "First Folio and collected poems" no matter which 'Search screen' one has selected for presentation upon start-up. Once one has completed a search, the results can be viewed in a number of ways. 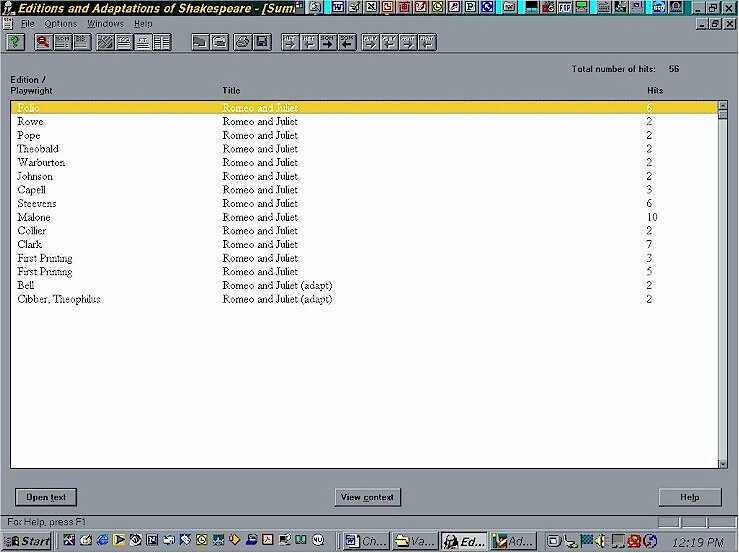 The first response of the software is a table giving a 'Summary of Matches' which, for each hit, lists the edition or playwright of the work in which the hit was found, the title of the work, and the number of hits found in that work. From the 'Summary of Matches' list one selects one of the works containing hits and chooses either to 'Open text' (which opens a window containing the full text of the work, allowing one to jump from hit to hit using the "->HIT" and "<-HIT" buttons in the EAS button bar) or else to 'View context" which lists the location of each hit within the work (by act, scene, and line number, if a dramatic text) and shows the text of the line in which the hit occurred. Within this 'View context' window one may also elect to 'Open text' and thus proceed to the full text of the work in which the hits occurred. One may leave open the full text window, representing the result of a search, while returning to the 'Search Screen' to commence a second search which results in a second full text window being opened. If this second full text window shows the same work as the first (perhaps being the same play represented in a different edition) the two windows can be synchronised so that movement in one is matched by movement in the other, the matching being done intelligently to keep the reader at the same place in the literary work even if there are textual differences between the versions. Thus it is possible to find the word "flesh" occurring the 1605 Q2 Hamlet and in the 1623 F Hamlet ("O that this too too sallied/solid flesh would melt") and then scroll down the Q2 text and, by pressing the 'synchronize' button, have the F text keep up by scrolling itself to the equivalent point. This most useful feature did not work perfectly: although this speech is largely the same in Q2 and F, EAS reported that "There is no equivalent point in Quartos and other first printings" when asked to bring Q2 to the equivalent of a given point in F, but was quite happy to bring F to the equivalent of a given point in Q2. This fault cannot be explained as Q2 lacking the "given point" chosen in F since this point was "too too" and it occurs in both versions. Unsurprisingly, when asked to synchronize works with large textual variations (such as Q1 and F Hamlet) the software appeared to become confused and jumped to places seemingly chosen at random. Q1: Is it euen so? then I defie my Starres. Q2: Is it in so? then I denie you starres. Mine is only one example of the kinds of searches one can make, but a revealing one in that I was under the impression every subsequent editor accepted Pope's emendation. Certainly, other kinds of searches are possible and are limited only by one's own imagination. Chadwyck-Healey is now a subsidiary of Bell & Howell Information and Learning, a company created after Bell & Howell acquired University Microfilms International (UMI), with its dissertation service and its Early English Books microfilm collection. Bell & Howell Information and Learning also owns the ProQuest information service, which includes the Internet Early English Books Online (EEBO) product. Chadwyck-Healey has long been the leader in online and CD-ROM historical and literary databases, with its jewel in the crown being the spectacular Literature Online (LION), which incorporates full-text databases of more than 290,000 works of English and American poems, plays, and fiction. 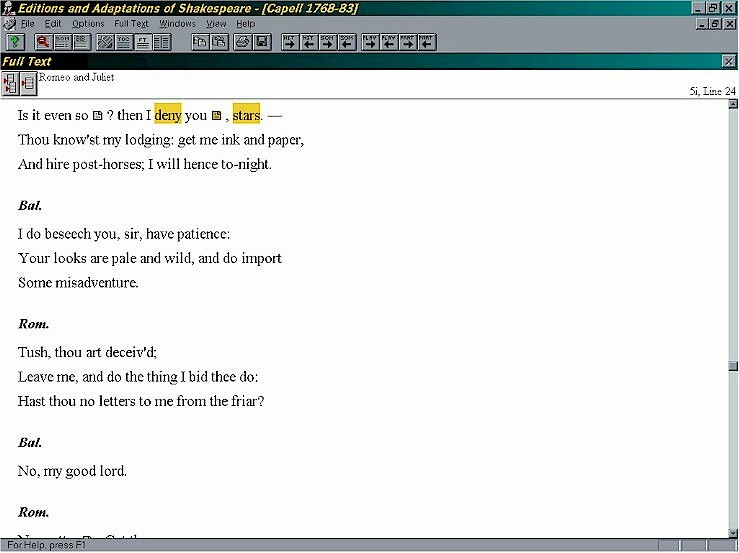 For early modern scholars, Editions and Adaptations of Shakespeare, one of the LION databases but also available as a standalone CD-ROM, is an impressive tool in the expanding world of computer applications in the humanities. My greatest regret is that now that I have completed this review I will have to return the CD-ROM to Chadwyck-Healey. My next greatest regret is that Chadwyck-Healey caters only to the large research library market. An individual simply cannot afford to purchase this CD-ROM. Thus, those of us who do not work at large research institutions will have an extremely difficult time taking advantage of this wonderful database, which is a shame.